Why do children memorize and recite so much poetry? We study poetry for its own sake. Memorizing poetry sows seeds of beautiful language, worthy thoughts, joyful living, and rich ideas. What is copywork? Copywork is our approach to penmanship. Students practice their very best handwriting by copying sentences from the living books they are reading. What are living books? Living books are those written by persons who are passionate about their subject and who find literary ways to thread facts into a gripping story that students want to read. We read living books instead of relying on smart board lessons and textbooks. These books feed the heart, mind, and soul with satisfying thoughts and living ideas. Do you use whole language or phonics? Learning to read requires a combination of sight words, phonics, background knowledge, and love of books. We design unique lessons around the books at schools that teach sight words, major phonics rules, and word making games with letter tiles. The curriculum offers a wide range of knowledge that helps students infer and search for meaning. Students enjoy books that we read to them which fuels the desire to learn to read. What is oral narration? Oral narration is the first step in composition. Children read (or hear a passage read) one time. They take turns retelling what they read or heard in their own words without looking at the book. Oral narration requires the mind to decide what is important, sequence, maintain a listener's interest, start with a strong beginning, make connections, use vocabulary, improve grammar, and synthesize information into a flowing narrative. They spend at least three years practicing the art of oral composition before writing paragraphs. Teachers are better able to assess knowledge because young students say much more than they can write. Why are there no spelling tests? The natural context for spelling is in writing sentences. We practice spelling through copywork and focus on specific rules through studied dictation. We create informal lessons to address common errors made in dictation. Why are there no lessons in writing mechanics? The natural context for mechanics is in writing sentences. Children observe correct punctuation, capitalization, and other elements in copywork. We create informal lessons to address common errors made in dictation. How is vocabulary addressed? Our book selection offers advanced vocabulary. Children pick up new words from the books they read and things they experience. We do explain difficult words before a passage or encourage students to infer and discuss meaning. Why is grammar postponed until fourth grade? The natural context for grammar is in learning a second language and Latin. Children develop curiosity about the relationship between words when comparing another language to what they already know about English. The study of grammar requires abstract thinking that is beyond the ability of young children. Why are creative and independent writing postponed until later? Writing is a complex skill that requires the ability to organize thoughts, consider the audience, write physically, and apply correct mechanics. Oral narration, grand conversation, copywork, penmanship, and studied dictation develop these abilities. Why do teachers continue to read aloud to older children? We offer a variety of reading levels: children read silently books at or below their reading level; they take turns reading aloud books at their level; the teacher reads aloud books above their level. In this way we inspire students to reach for challenging books. Why don’t you offer lessons in editing sentences with errors? We want to expose them to only materials that have correct spelling, punctuation, and grammar to avoid confusing them. Errors may imprint in the mind. What do you use instead of workbooks? Students keep different notebooks based upon grade level. They draw, write, and copy diagrams and illustrations. Laurie Bestvater, author of The Living Page and part of the prov-en-der team that trains our staff, has helped us with notebooking. In math, they record their work on grid paper (which mathematicians and engineers prefer) and do occasional worksheets. 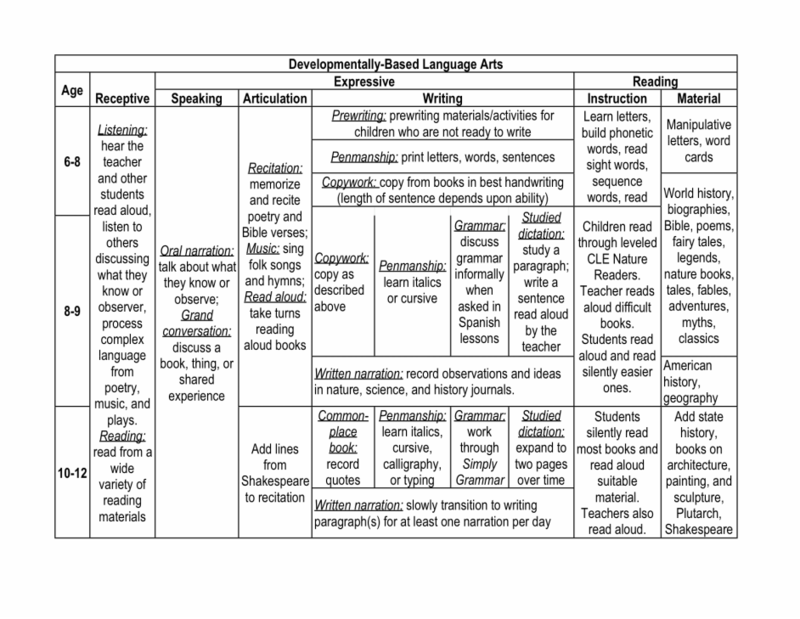 Does Charlotte Mason’s developmentally-based language arts progression line up with state standards? We have a common aim in designing a curriculum offering a wide body of literature from a variety of times and places for a community of learners to read, write, discuss, and research. Mason aligned her progression on how children develop. We teach children what they need to know when they are able and when they need to know it. It reduces the level of frustration for children who are delayed in some areas but are not developing quickly enough to keep up with the standards. By the time they reach middle school, students communicate complex thoughts orally, in writing, and through other media (art) with a rich vocabulary. What they have learned becomes part of who they are, and their knowledge base enables them to excel academically as they head toward graduation. Please email our curriculum coordinator, Tammy Glaser, if you have any further questions.